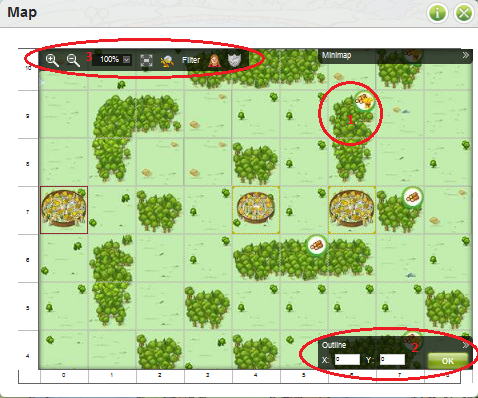 How to use village overview, village center & map? This is your village overview. It is the main page you will see when logging into Travian. Box 1: This is the list of the resources you currently have stored in your village (the number shown above each resource type), and the total amount your storage can hold (the number shown to the left of the wood, clay and iron resources and to the left of the wheat resources). You can’t have more than the amount you can hold, and it is not recommended that you allow your resources to fill up, because that would cause an overflow or a waste of resources. The small bars beneath the numbers will be green in color if you are safe from overflowing, but will become red once your resources begin getting wasted. All the way to the right, there is a small image of wheat with a red cross over it. This is your free crop. Free crop is the total amount of crop that you have available to continue building. Box 2: This is the main overview of all of your resource tiles. To keep your village growing you will need to upgrade these tiles which will increase production. These resource tiles are a way for you to build up a strong economy. 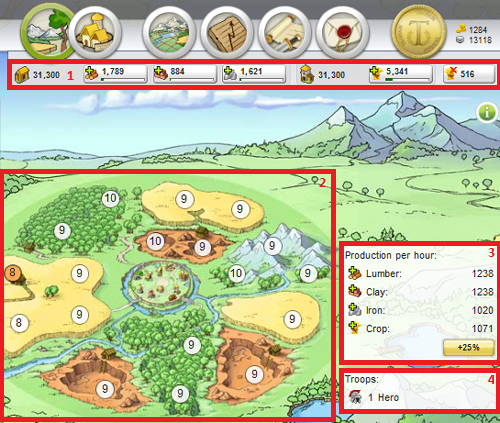 In Travian there are four resources to be produced: crop (also called wheat), lumber, iron, and clay. All four are important but crop is vital since you will need enough to feed people and soldiers in your village. Also, some resources are more valuable to certain tribes. Gauls, for instance, need a lot of clay. Romans need a lot of iron and Teutons require an abundance of wood. Box 3: This shows the amount of resources your village currently produces in an hour. As you build and upgrade your resource tiles your production will increase. Also, it is important to note that the production shown here will automatically reflect any bonuses you have i.e. +25% bonus from using gold. Box 4: This shows the units you currently have in your village. With the exception of your hero, as you just started, you will have no troops in your village. This is the village center page, where you can construct new buildings and order troops to be researched and trained. You can see that three buildings are already up. The main building is one of the most important buildings you have since it is a required to build almost every other building. A granary and warehouse are also built. There are 16 building lots on the outside ring and 4 building lots on the inside. There are also 2 special building spots - the wall and the rally point. 1. (Red): This is where you build your City Wall (Romans), Earth Wall (Teutons) or your Palisade (Gaul). Any of these wall will protect your village, the higher the level of the wall the higher defense bonus. 2. (Orange): This is where you build your rally point. Your village's troops meet here. From here you can send them out to conquer, attack, raid or reinforce other villages. The higher the level of your rally point the better your catapults are at hitting what you want them to. The rally point is also needed to build a barracks and some other buildings, so without one constructed in your village, you can’t train any soldiers. Here you see the map. The map is one of the most useful and highly used features of the game. 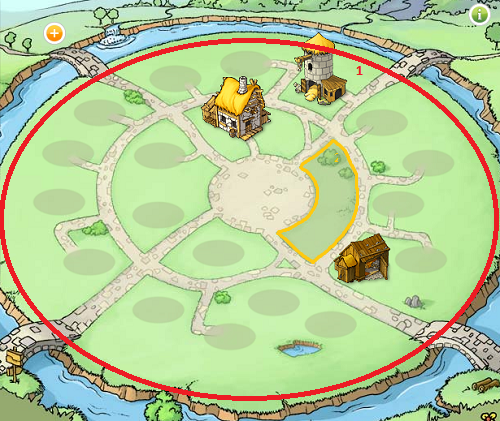 In the centre of the map, surrounded by a yellow square, is your village. The villages with no colored square are your neighbours villages. Blue squares are villages in your alliance, green squares are alliances that are allied with your alliance, and light green squares are NAPs. If you scroll over a village you can see details about that village, like the name of the player, the population of the village, and the Alliance of the village. If you click that village it shows you more detail about the village and gives you options such as raid the village or send merchants to it. 1. This is an oasis. Your hero can conquer these by upgrading his hero’s mansion and then sending attacks to the oases. Oases provide a production bonus to your village. If you click on the oasis you will see information about it such as how many wild animals are there and what percent the bonus is. You also have the option to raid the unoccupied oasis for resources. You will need to upgrade your hero’s mansion to level ten if you wish to conquer an oasis. If you upgrade the hero's mansion to level 15 you can capture a second oasis and upgrading to level 20 lets you capture a third one. 2. In the red circle in the bottom right is an area where you can type in coordinates of villages on the map. This is a quicker way to move around the map if you know the coordinates of the village you want to go to. 3. The red circle in the top left shows a group of buttons that provide various functions for the map such as increasing or decreasing the zoom level, opening the map in full screen, finding croppers, showing your marks and showing alliance marks.